The greenhouse where I work is only a small part of the overall business: there's also a flower shop (which delivers). One of the guys in the flower shop and I were discussing peace lilies (Spathiphyllum spp. ), and he commented that he has a lot of people call up and want to order a green plant of some kind, but of course they don't know their plants especially well, so they almost always wind up asking for a peace lily, because it's the only plant they know by name to ask for. I said the same kind of thing happens in the greenhouse: people come in and want something, but they don't know what, so they buy a peace lily (or a Dracaena marginata) and they're on their way1. So the flower shop guy and I commiserated for a while over our shared disgust for peace lilies. Or, well, it wasn't exactly like that. Certainly the word wouldn't be disgust. But all the same, peace lilies get way more attention than they deserve, and they're not easy enough that they should be everybody's first plant, though it increasingly seems like they are. The pluses first. They do often have nice foliage. There is a medium-sized variety with thinner, glossy, very dark green leaves (wallisii?) that can be quite the knockout, whether in flower or not, and I am a huge fan of the very large cultivars ('Mauna Loa,' 'Sensation') because I find them significantly easier to care for than the medium and small ones. Plus being a sucker for large plants to begin with. There are also not many other indoor plants that can be induced to flower as easily or as abundantly, which is a plus if you like the blooms, though I find them hard to like, myself. And it's also a plus that the Spathiphyllum is willing to accept less light than most plants. That quality, though, is why they're so often labeled as easy-care plants, I think, and that's not quite right. One of the more notable features of Spathiphyllum is that when it dries out, the leaves visibly droop, to the point where in severe drought, they will all lay flat on the ground. Give it water, and within a few hours, the leaves pop right back up to their original positions. This would be a good indicator of when to water, except that by the time things reach the point of laying flat, damage has been done: the roots die back slightly each time this happens, and if it happens often enough, it will eventually fail to come back at all. I suggest that beginners get to know your plants better than this: the drooping process lasts two or three days, from the first indication of dryness to leaves laying flat. If you know your plant well enough, you can see the change in posture on the first day, and water then, and never have to deal with a slumping plant. Spathiphyllum negatives: it's difficult to get the watering just right. If it's too dry, it'll let you know, by drooping, and that’s useful, though not something you want to rely on. If it's too wet, there's a tendency for plants to rot where they sit, except that they do it in such a way that you don't necessarily realize what's going on. One day you go to pull off a dead leaf, and a whole rootless plant comes out. This will generally not be salvageable. To make things trickier, the plant (like a lot of other plants) responds to being too wet by – you guessed it – drooping, which would make an inexperienced grower think that it needs more water. A more subtle indicator of overwatering manifests as blackened leaf tips, which quickly spread to the margins of the leaf. The prevailing wisdom is that blackening leaf tips and margins means too much fertilizer or air that is too hot and dry, and it's true that a lot of plants do react this way. 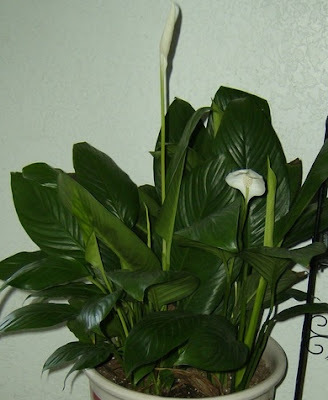 However, it's been my experience that, nine times out of ten, a peace lily with black leaf edges is suffering from root suffocation, either because its soil has broken down and compacted, or because part of the soil never gets to dry out. Especially in a very large pot, and especially especially in a plant that's been overpotted (put in a pot that's too large for the plant), and especially especially especially in a plant that's in a very large pot, too big for the plant, with no drainage hole, the top of the soil can dry out while everything after the top three inches is soaking wet. With very large plants, it's probably actually best to wait for the leaves to go a little limp before watering again. Common sense is important. If your plant is droopy and the soil feels wet, the plant is obviously not drooping because it's too dry: don't give it water. If the plant looks fine and the soil feels dry, the plant doesn't need water just because the soil is dry: wait for the leaves to get a little limp first. Spathiphyllums are nothing if not good communicators. They are also prone to go into sudden tailspins over nothing (or at least not over anything a new houseplant owner would be able to detect: the most likely cause is one of a few fungus infections that afflict Spathiphyllum more than most), which can make them frustrating. This isn't terribly common, but it's happened to me before, and I see it from time to time in the plants at work as well. I do not find humidity to be an issue at all, ever. This will surprise some people, but, you know, show me a plant that's suffering because of dry air, instead of because it's too wet or too dry, and I'll change my mind. Until then, I wouldn't worry about it, because I've never seen a case where it obviously made a difference. In the time I've been at Garden Web (since Dec. 2006), I've seen more people post about issues with their peace lilies than any other plant, no contest: too many marketers think that the only important thing about a plant is how much light it needs. It's true that Spathiphyllum doesn't require a lot of light; that doesn't make it the best plant for you, any more than knowing Jennifer Anniston's name makes her your best friend. I totally agree with all your opinions about spaths - could not have said it better myself! I'll have to find one of the golden flowered ones. I have a variegated 'Domino' and wish I had room for a 'Sensation' or other gigantic variety. Yup, Peace Lilies are not as easy as people think, especially the ‘water-juggling’ dance that is part of their care requirements. But they are pretty plants, especially while in bloom, which makes it hard to leave them behind if you’re looking for something appealing – for yourself or as a gift. But I'd only give this plant as a gift to very experienced growers, individuals who are already aware of the Peace Lily’s intricate and sometimes maddening characteristics, and don’t mind dealing with them. I agree with all your comments but when growing well this is such a useful / attractive plant. I had no idea whether a peace lily was easy or not when I inherited one, but it was a gift at my father's funeral, so the darn thing has taken on sentimental importance. It has small leaves (the size of a ladies hand at most). The big problem is that it seems to be picky about what I water it with. If I use tap water, even tap water left in an open container for 24 hours, it gets dried brown "rust" on the edges of its leaves. The only solution so far has been to use bottled water for it. But this is getting quite expensive, and the darn thing gets higher quality water than our 6 month old son (who drinks filtered tap water). Any suggestions? Is the water connection all in my head, and something else is causing the 'rust'? It would maybe help if I could see a picture. Ordinarily, if there's margin burn like what you describe, it's not about the quality of the water, it's about the roots being too wet. How large of a pot is the plant in? Does the pot have drainage holes in the bottom? When you water, are you giving it a tiny bit of water at a time, or drenching the root ball? Have you repotted? Have you fertilized? Are you using a water softener? Is your tap water known to be particularly bad for some reason or another? Can someone help me. I just bought a beautiful Spathiphyllum and after I got it home (it's been 3 days) the leaves are turning yellow and drooping. Is there anyway to salvage this plant it was expensive and it was beautiful. It was my first experience at having a house plant and I think I gave it too much water. Can anyone help me. At this point, I think all you can do is just water only when it needs it, and wait. If you bought it very recently, they might let you return or exchange the plant, even if it was your fault for overwatering, if you're nice about it. Sometimes Spathiphyllums have fungal infections when they leave the grower; if at some point you try to pull a dead leaf off and a whole plant comes out instead, without roots or with very few roots, then that is probably the issue more than your watering. In that case, it's not your fault, it's the grower, and you probably actually ought to go back to the store and be a pain until they agree to give a refund or exchange. Hi, I have a nice peace lily that I got for $1 at Stop and Shop on the clearance rack in the spring. It has grown insanely well, over a foot both in height and width( it was really pathetic when I bought it). Unfortunately, it got left in our offices over the long weekend, with out any heat on! It is still very green, but every leaf is completely limp! Is there any way to save my baby? Hard to say without being able to see the plant. If it's wilted because it's dry, then watering and giving it appropriate care from here on should revive it. If it's wilted because it froze, then it's already dead, and nothing you do is going to bring it back. As always with plants that have been exposed to too much heat or cold, it's too late to do anything now. All you can do now is give it the usual care and hope that part of the plant is alive. It's not really that complicated; they grow from thick rhizomes that branch occasionally, so to split one, you just have to cut through the rhizomes with a clean, sharp knife and pot them up. If you're seeing brown tips, though, that may be a sign that you're giving the plant too much water. Mineral buildup in the soil is also a possible cause. If the problem is mineral buildup, then dividing the plant will stop the browning; if the problem is that you're watering too much or too often, you'll continue to see brown leaves even after the split. My grandmother passed a couple weeks ago and I brought home a peace lily. A few of the prickly things in the whitish greenish flower are turning completely brown and I also noticed a couple of the leaves have a brown spot about the size of a dime about a ¼ off the way down from the tip. Is the Browning of the prickly part normal and what does the brown spots mean on the leaves? Yes, it's normal for the spadix to brown before the rest of the inflorescence does. Brown spots on the leaves is a fairly generic problem. Ordinarily, I'd say it probably means that the plant is too wet, but if you've only had it two weeks, it could just mean that it was too wet a few weeks ago and is only now getting around to showing the signs. If it persists, then you're probably watering too often or making the plant stand in its drainage water. "Why are you droopy? I've just watered you!" "Yeah, yeah I know... but the light, it's just.... it's just not quite right today. It's making my leaves look fat..."
"One moment i'll fix the light... There." "It's too bright now... look, look! I'm all bright green." While it's really not the easiest plant in the world (at all, temperamental little beast) there is something delightful about it's character in my opinion. I've never argued with any other plant and felt like it was arguing back! Now then, I'm off to water the damn peace lily. I have a piece lily in my small office, a beautiful plant with leaves 18 inches long and ten wide.I don't fertilize just good clean water. One of my customers came in the other day and told me the plant hangs on to bacteria and does nothing for cleaning the air and asked if she could cut away some of its leaves. Bacteria are pretty much everywhere. It has nothing to do with being a plant or not. The customer herself almost certainly carried way more bacteria on her than the plant ever could, and they were way more likely to be harmful bacteria, for the simple reason that bacteria that harm humans will tend to hang around humans. Most bacteria are harmless to people. So it's one of those cases where she's technically correct (yes, there are bacteria on the plant) but not in a way that matters (that doesn't mean the bacteria in question will harm anybody in any way). They do clean air. I think the air-cleaning abilities of houseplants have been exaggerated, but a houseplant isn't going to make your air any worse. So I wouldn't listen to her on that count either. Can you tell me what size pot my peace lily should be in. It is about 12 to 13 inch dia. at the soil line, about 5 feet tall and about 5 feet wide at the height of the middle of the leaves. It seems to be drooping and I have only had it about 2 weeks and I can't tell if I am watering too much or too little. If it's drooping and the soil is wet, you're watering too much. If it's drooping and the soil is dry, you're not watering enough. A sharpened wood pencil will work to find out if the soil's wet or not, if you don't want to use fingers. The pot should be large enough to fit the roots, with a margin of about an inch of soil for the roots to grow into. There's no way I can give you a number without actually being able to see what shape the roots are actually in. Is your Sensation/Mauna Loa still alive...are these generally long-lived plants? I've had one (actually 3 in one cramped pot) since February of last year, and hope it lasts a while. It's doing great now, getting huge...I'm not excited about repotting it, but surely that day will have to come soon. It's not, but it lasted a little over 11 years before it died. It probably would gave gone longer than that, had I not gotten anxious about how infrequently I was watering it, but I did, and that eventually led to it rotting out. I've always found them easy, they are really obvious about watering needs, and I've had mine come back from pure neglect and adverse conditions (2 house renos, death from no water, death from too much sun) no problem. Can't honestly say that about many houseplants. They flower 2 x yearly (spring and fall) and I am not a gardening fusser (minimal feeding etc.) I like the smell of the flowers (like Crest). I've had mine about 15-20 years. It goes outside every summer in filtered light. I have repotted my peace lily because there were knats flying all around it. I was told it had root rot so I washed the roots and replanted and only water once a week and the pot has drainage that I even pour out. THEY ARE BACK. what's wrong. The leaves are drooped and turning brown. I want to save it because it's from a relatives funeral. What can I do??? Brown leaves mean that it's been too wet or too dry in the past; when a plant's root system is damaged, it often takes a while for the damage to become visible in the leaves. It's definitely possible that the plant is already too far gone to save; certainly if the leaves are droopy all the time, whether you've just watered or not, that's a bad sign. It also makes it tougher to water in the future: I usually go by whether the leaves are drooping or not, and obviously you can't do the same if the leaves are always drooping. Instead, you'll have to check how moist the soil is toward the center of the root ball, which you can do by sticking a finger in and seeing if you hit anything wet, stick a wooden pencil in and see if, when you pull it out, the wood comes out wet, or trying to get a feel for how much the plant weighs when wet and when dry, and water by weight. The finger method is the most reliable. Either the plant will eventually perk up and start to produce new growth again, or it will flop completely over, rot out from the roots, and undeniably die. In the latter case: keep in mind that the plant is not the relative. It's a symbol, sure, but if the plant dies, that doesn't mean that you don't still care about the relative, or that they're more dead, or whatever it is that the death of the plant would feel like to you. It's only a plant. Sometimes plants die. Often they can be replaced. If you feel like you still need a symbol, you can go buy a different plant -- peace lily or not, it's up to you -- and just tell yourself that the new plant is now the symbol. I mean, maybe that's not a trick that everybody is capable of pulling on themselves, but you may as well give symbol-replacement a try. Worst-case scenario, you'll have a new plant. Thanks for this. I’m a houseplant beginner and was told by the ENTIRE INTERNET that Peace Lilies were unkillable plants that could grow in a cave and survive the apocalypse. Imagine my surprise when mine has hovered on the verge of death for a year now. I’m only in my office 3 Days a week, and if I don’t water enough it lays down flat, but if I water too much it drops and I get confused about what it needs, and sometimes water again. I guess I’ll take your advice and get a pencil. I’m getting new growth now, but reading this article I’m now sure I overwatered on my way out and when I come back next week it’ll be dead. Any suggestions for a replacement plant? The spider plant is doing great, so I’m not a complete failure. North facing window in a rainy city, if that helps. With the exception of Radermachera sinica (which I no longer recommend that anyone grow under any circumstances), most of this list probably works. A few might not work well if your office tends to be hot or cold.